Yesterday they played at Johnnys Futura Bold, today they shoot their music video at Heinrichsplatz: Die Ohrbooten. “Another Street in Berlin” is a photo documentary by photographer Jo Jankowski about Berlins Kastanienallee a.k.a. “Castingallee” now showing in Galerie Walden. Which is of course on Kastanienallee. Just ran into this entertaining story about a typical night out in berlin over at Modestes Blog. Enjoy! Couldn’t have depicted it better! Ending 30 years of violence and terror, the IRA has offically called an end to its armed campaign in the UK. So last but not least, there are good news these days! My best wishes go out to the UK and our fellow bloggers in London. If you can’t recall what the fighting was about, check out the entry at wikipedia. The explanation there may not be too reasonable, but nevertheless interesting. Or check here for the BBC version of it. 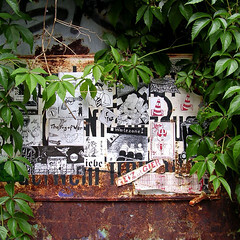 Found through Technocrati’s flickr plug-tag-searchorizerTM. Love this one. If you ever noticed those paintings on walls, construction sites/fences, lampposts and so on ’round town (I think especially in Mitte) which always include a domain name, check out streetart. When people come and visit me here, they all want to go to Potsdamer Platz. Surprisingly, this place is in every tourist guide, and they call it a “must visit”. It ranks up with the big stuff, Brandenburger Tor or the TV Tower. I love the place. I’m not a big fan of it. I don’t care much for its architecture. During the day it’s crowded with tourists, and there’s not much to see anyway. Well! Looking for the Sony Style Store? Overpriced food, drinks, etc.? This is your place. But, there’s a cinema at the spot, and I went there to watch movie tonight. Enjoyed it too. Oh, and the ceiling changes colors. Chicks dig it. Congratulations, we have a liftoff. Discovery is back in business and me poor boy got to sit here and work on some webpages. But right now, after havin seen live footage from a camera ontop of the fuel tanks I skip work for a minute and checkout this to see what they got. The guys at NASA seem to be to happy to react to me being hungry for information. That thing is flying since 20 minutes and still no photo on their websites. However, look at the crew, they dress up in the same colour as Berlins refuse disposal service. I am sure you will see those spectacular footage sooner or later before the day ends. Bon voyage Discovery. ps: Does mankind have to travel into space? Is it worth it? Are we meant to be more then earths skin desease? Tell me. Munim It is good to see posts coming back. Categories Select Category art Berlin eating and drinking euro2008 Film Gifts to the World graffiti history in eigener Sache music news observations outside the city photography shopping streetart stuff to do Uncategorized Urban legends urbanart Where is it at?